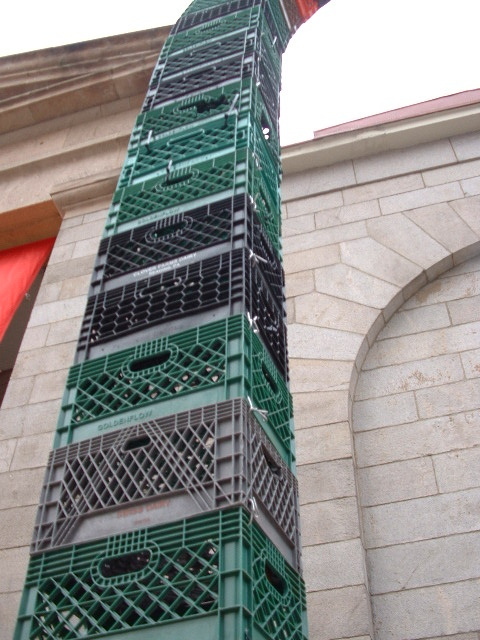 I wrote last week about Wayne Cambern’s show at the Boston Street Gallery. While I was there, I got a tour of the building that houses the gallery and met the owners, Jeff Harris and his wife Maria who are artists themselves. Jeff works in wood and steel stock. 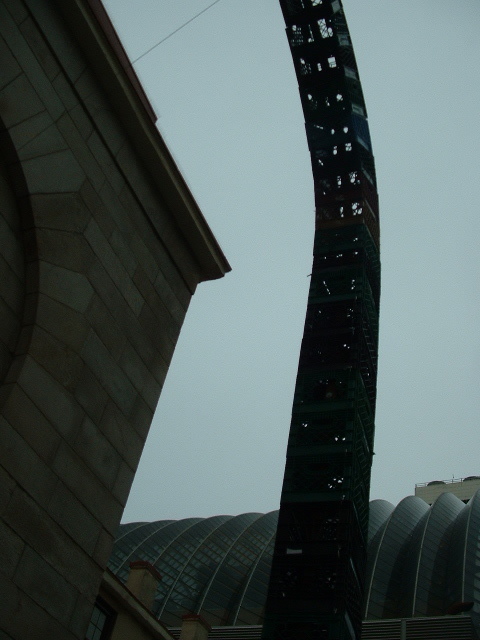 His massive sculptures fill half the gallery and his studio and workshop are in the rear. The building itself has an interesting history. Built in the 1880’s, it housed a coffee roasting factory that supplied the US armed forces during both world wars. Kensington used to be full of factories Now, many of those former factories are finding new lives as art galleries and artist studios. Jeff started out as a photographer but soon moved on to other mediums. He told me that his first love was wood and he still works with the material. 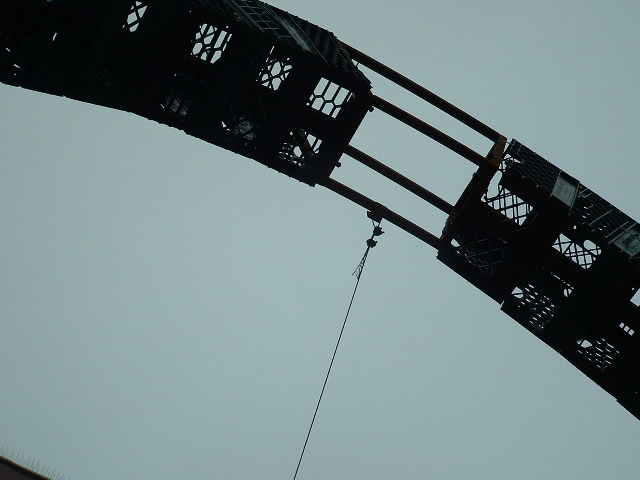 But he found it too limiting for what he wanted to do, so he started working with steel stock. When I saw Jeff’s work I assumed that I’d find torches in his workshop. How else could he get those bends and shapes? The answer? A big vise and some simple tools. No heat except to weld pieces together. Jeff and Maria also give painting classes on the second floor of the building although they are more for fun that for “serious” art. For more information, go to the web site, to http://www.artwithspirits.com. Philadelphia unveiled its first public monument to an African-American in September 2017. 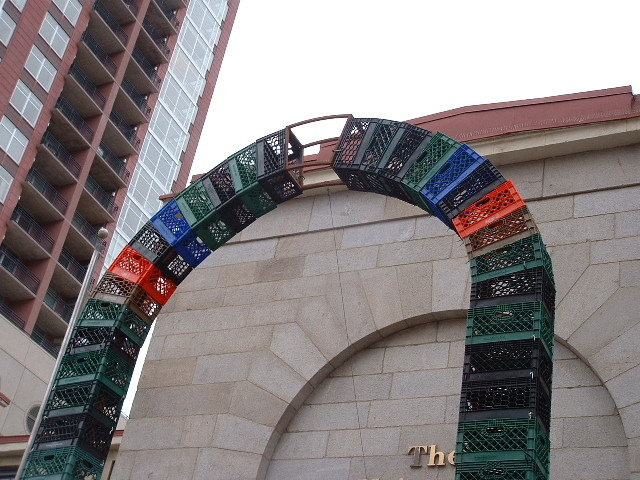 “A Quest For Parity” is located on the south apron of Philadelphia City Hall. Who was Octavius Catto? He was an athlete: He established the first successful African-American baseball club in Philadelphia. He was an activist and a key figure in the protests that led to the desegregation of streetcars in Philadelphia. He was an educator, teaching at the Philadelphia Institute for Colored Youth. He was a soldier: when the Confederates invaded Pennsylvania in 1863, he raised a company of Black soldiers, one of the first volunteer regiments of volunteers in the Commonwealth. He served as a Major and raised a total of eleven regiments during the war. I ‘ve always thought of Octavius Catto as a Philadelphian even though he was born in South Carolina. He settled in Philadelphia and met his fiance Sarah Le Count here. The building that housed the Philadelphia Institute for Colored Youth still stands on Bainbridge Street a few blocks from my home, as does the spot on South Street where Catto was gunned down in an election day riot in October 1871. He was 32 years old. Too soon for his work to be done. The statue of Catto is beautifully rendered by sculptor Branly Cadet who designed and executed the monument. 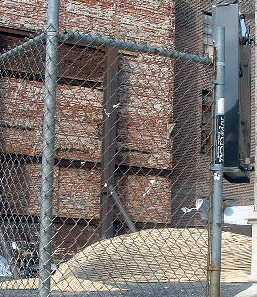 The picture at the top of this post shows the gleaming metal ball that sits in front of the statute and reflects Catto, Philadelphia, and the passers-by. The twelve-foot bronze statue is imposing and lifelike; Catto seems about to tip off the pedestal. Is he running? Is he making an impassioned speech? Cadet aptly portrays Catto as a man of action, an activist, passionate and relentless. If you find yourself in Philadelphia, go see the monument. To read more about the monument and the artist, press here. To see a documentary film about Octavius Catto, press here. Just some pictures this week. I hope you like them! I recently had the opportunity to see an exhibit at the new home of the Fabric Workshop and Museum . It’s a roomy, comfortable space that takes up several buildings on Arch Street in Philadelphia. 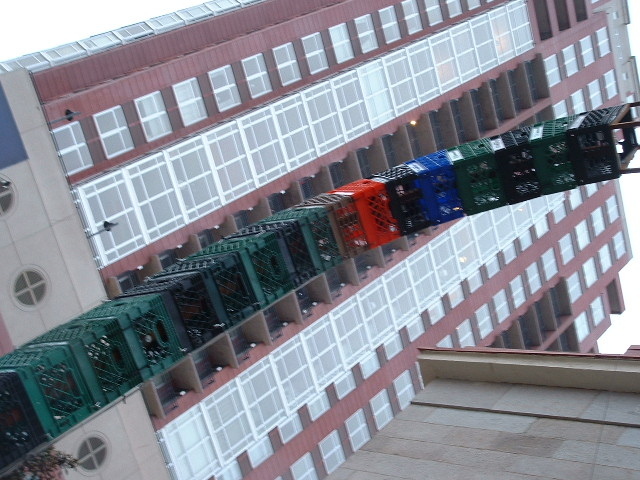 You no longer have to climb flights of stairs to get to the exhibits and it’s conveniently located on across the street from the Philadelphia Convention Center. The current exhibit, New American Voices II showcases the work of four invitational artists-in-residence: Bill Smith, Jiha Moon, Robert Pruitt and Jim Drain. New American Voices II was definitely not the visual version of a string quartet; it was the work of four soloists, each of whom chose different media and themes to express a unique point of view. The FMW tries to showcase artists from across the United States with varied backgrounds and perspectives and encourages them to work with materials they might not have used before. From what I saw the FMW accomplished its mission and it looks like the artists enjoyed the process. The exhibition had so much to offer that I can only hit the highlights in this post. To get the full flavor, you must see it for yourself. South Korean-born Jiha Moon’s mixed media wall pieces combine collage, sewing, painting, and screen printing with an Asian color ﻿﻿﻿aesthetic. She makes plentiful use of Asian and American popular culture symbols and much of her work reminds me of traditional Asian embroidery, not because of any needlework she might usem, but because the designs are expansive and flowing. Much of her work consists of fanciful pieces that incorporate images from folklore and advertising , but she showed her serious side in a work that appeared to explore the tensions between North and South Korea. The piece below, which is a little different from the others, features pin cushions, ribbons and beads. Jim Drain’s huge (and I mean XXXXXL) colorful machine-knitted dolmen sleeve sweaters remind me of the big suit David Byrne wears in Stop Making Sense, and fantastic Noh costumes. I suppose they could be worn, but they were displayed on stands that let the viewer examine every nuance of the designs. A two-dimensional picture cannot convey the surprises that jump out as you circle the sweaters. The colors shift and there are lots of subtle details and embellishments. At first, the color choices appear to be mostly random but on further examination, you realize that every skein and thread works with everything else in the sweater. Nothing is there that doesn’t belong. What fascinated me most about Robert Pruitt’s work was his use of period cameras to photograph members of a fictional African-American family to depict ancestors from years past like you’d see in a family album. Now that’s attention to detail and real dedication. For me the most powerful photograph was one of a young woman wearing a grass skirt and what appears to be a European colonial officer’s dress uniform jacket. 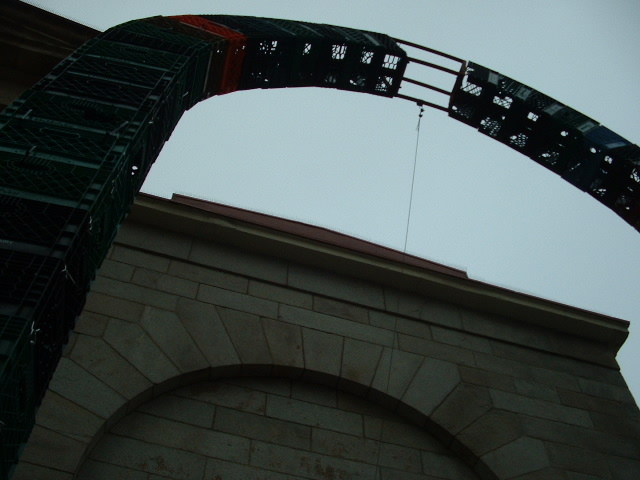 The golden shoulder cord is replaced by rope that appeared to be a noose. Pruitt also uses traditional African symbols and imagery pulled from contemporary urban America. I found his work disturbing and compelling. Bill Smith’s mechanical sculptures meld engineering and art in a way that any fan of Jules Verne or Nicola Tesla would admire, but his inclusion of organic objects like Emu eggs and feathers along with organic looking plastic forms that resemble jellyfish or brain synapses takes his work out of the realm of Steampunk into another world that seems really strange (or is it strangely real?) Along with Emu eggs, he takes water, magnets, quirky copper wire, electronics and computers to fashion several interactive contraptions that manage to look organic, old-fashioned and futuristic all at once. When walked up to one sculpture, the Emu egg started to spin, the wires started to sway and the room filled with a low humming sound. Then projectors started flashing images onto the white walls of the gallery. Amazing. Here’s a video of a similar device he designed and built. 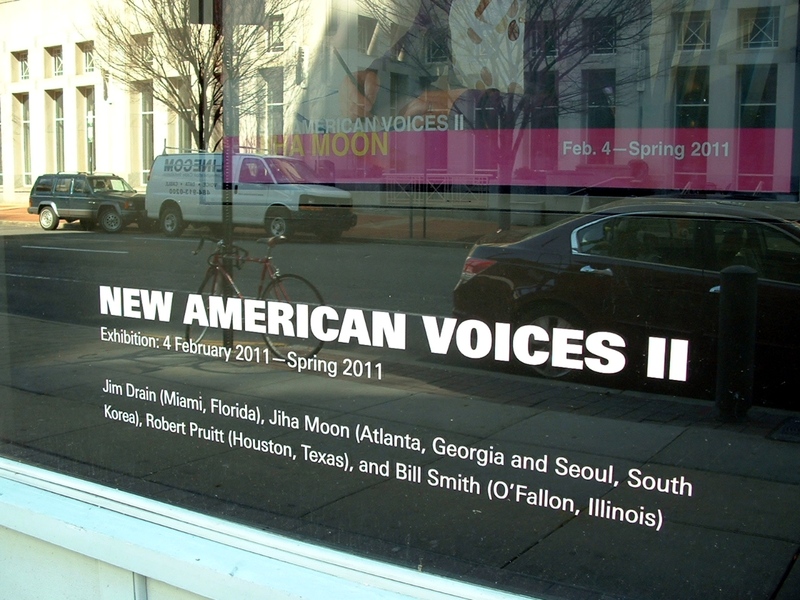 New American Voices II runs until the Spring. Admission is only $3.00 but you can donate more if you like. Treat yourself to this exhibit and the ones planned for the future. We are so lucky to have a venue like the FMW in Philadelphia. Let’s support it. For more pictures of the artists’ work, press here, here, here, and here. 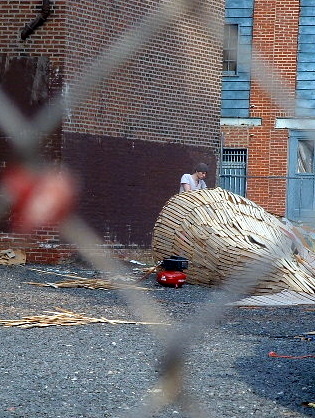 Artist Shay Church enlisted the help of students from the University of the Arts in Philadelphia to complete his life-sized whale sculptures. 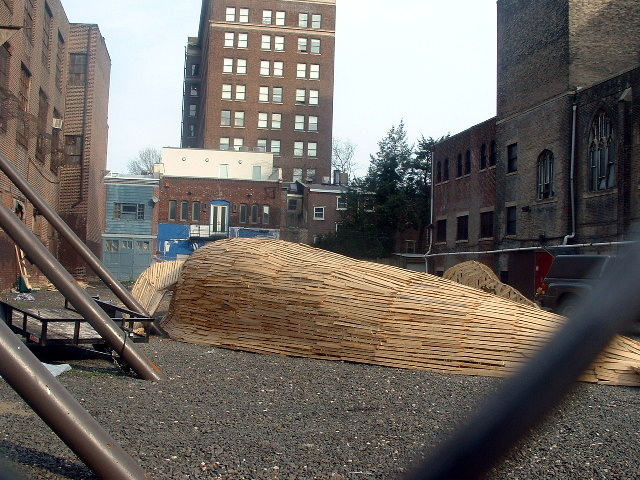 Whale-shaped wooden forms were covered with wet clay for an installation that coincided with the opening of the 44th Annual Conference on the National Council on Education for the Ceramic Arts. I’m not one of those people who think I’ve seen everything. 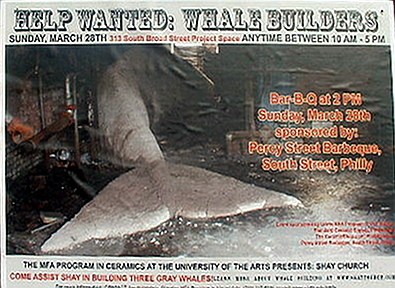 Still, I was surprised to find whales on South Broad Street in Philadelphia on a March afternoon. Press here to see a short film of the construction of another one of Church’s whale installations. To see more of Shay Church’s work, press here. 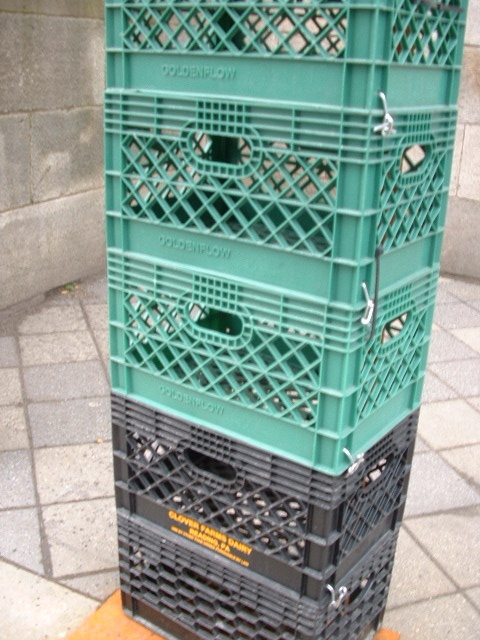 How did You use Milk Crates in College? 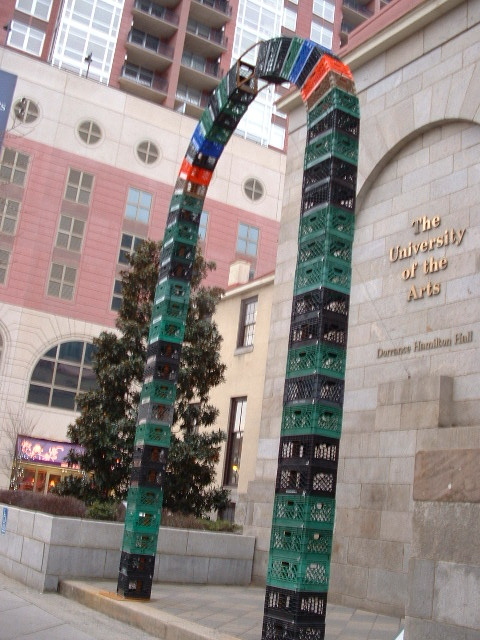 Art, art from recycled materials, art, creativity, crafts, inspiration, Joe Girandola, Philadelphia, recycled art, recycling, repurposing, Sculpture, University of the Arts Philadelphia, Urban, Urban ArtifactsArt, creativity, Found Object Jewelry, inspiration, recycling, repurposingLeave a Comment on How did You use Milk Crates in College? Ok, so maybe Joe Girandola is not in college anymore. 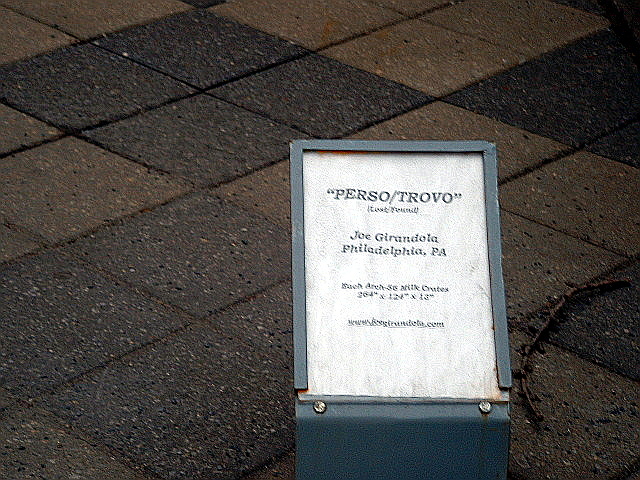 In fact, he’s a sculptor and teaches at the University of the Arts in Philadelphia. Sometimes I walk up Broad Street on my way to work past the University’s buildings. Imagine my delight winter day when instead of snow and gray skies, I saw these. Here’s a short film showing some more of Girandola’s work. It’s pretty obvious he has a sense of humor. I mentioned last week that I took a two day class called Forming Lasting and Meaningful Attachments with Robert Dancik and sponsored by the Philadelphia Area Polymer Clay Guild. We learned all about cold connections in jewelry making including riveting, tabbing, gluing, fold forming, and fastening with miniature hardware. We also learned about different types of resins, epoxies, alternative art materials, and how to use them. 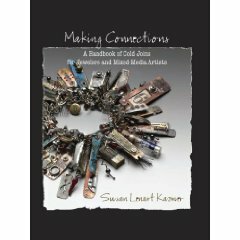 Want to learn more about cold connections? 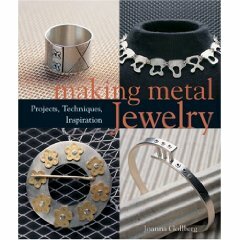 Some of my favorite books on this topic are Wrap, Stitch, Fold & Rivet by Mary Hettmansperger, Making Metal Jewelry by Joanna Gollberg, Making Connections by Susan Lenart Kazmer and a book on the Godfather of cold connections, Alexander Calder, Calder Jewelry by Mark Rosenthal. 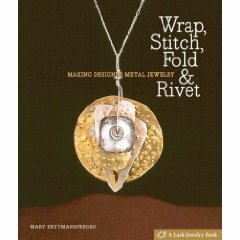 And here’s a good illustrated article on how to make rivets by Patty Fleishman. 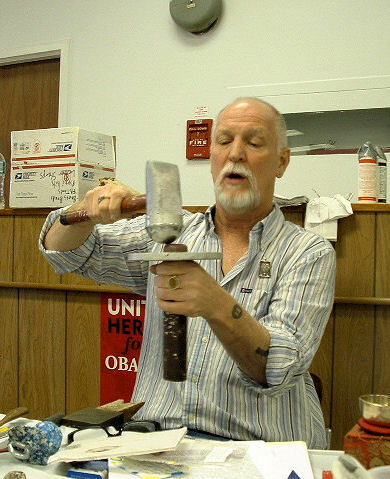 To see more pictures from the Dancik class, go to the Philly Area Guild’s Flickr site. I came upon Altered Curiosities by accident. It’s not the kind of book I would usually buy. But boy, I am so glad this book made it to my door. Don’t pass it by like I almost did. 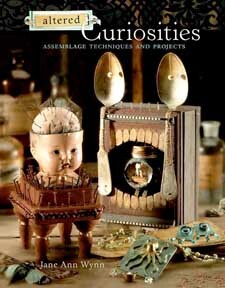 It’s packed with information on all kinds of crafts that seemingly bear no relation to one another. 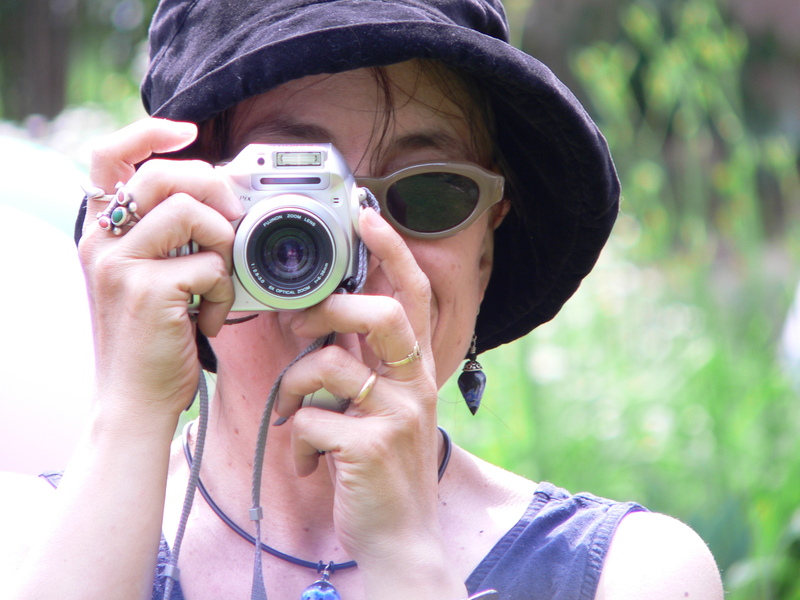 Yet author Jane Ann Wynn pulls them all together, with unconventional materials, and makes art. I didn’t try any of her projects, but I read through the book more than once and am taking inspiration from it for my own work. For example, I love the look of rust (but not on my appliances, please! ) and patinas. I picked up a rusty washer on the street the other day and struck up a conversation with it. 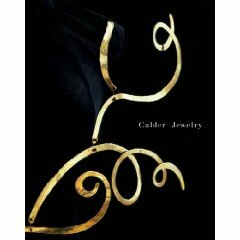 When I was finished, I had this pendant. 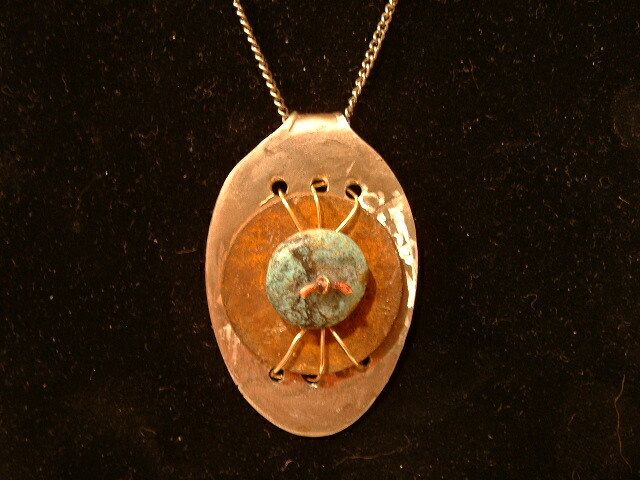 I added a silver plated spoon hammered flat, gold filled wire, turquoise and copper. I think that Altered Curiosities got me thinking in a new way. 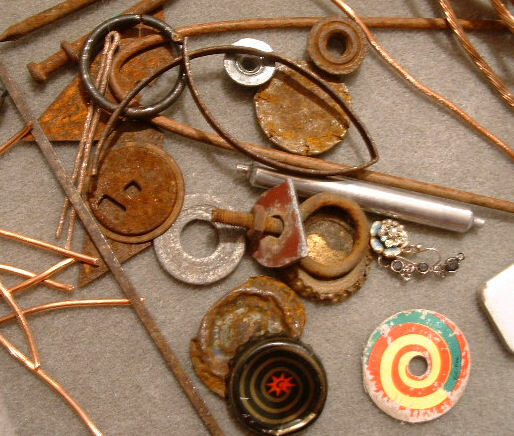 While running errands today, I found all these cool rusty bits on the sidewalk. These are going to end up in something. I’ll wait for them to talk to me first, like the washer did. 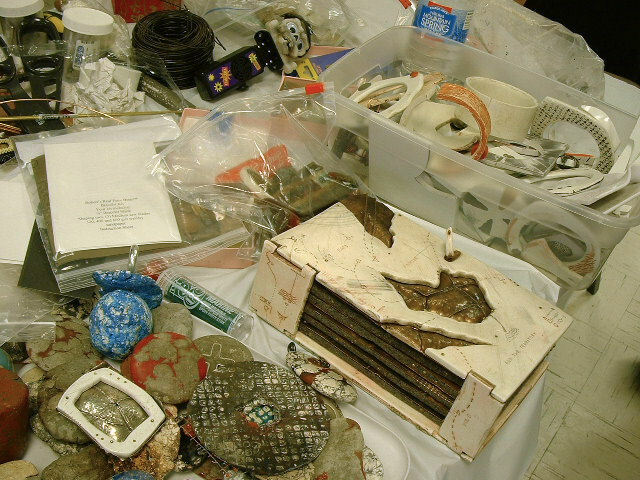 If any of this appeals to you, check out the art of Annette Tacconelli’s Urban Artifacts. 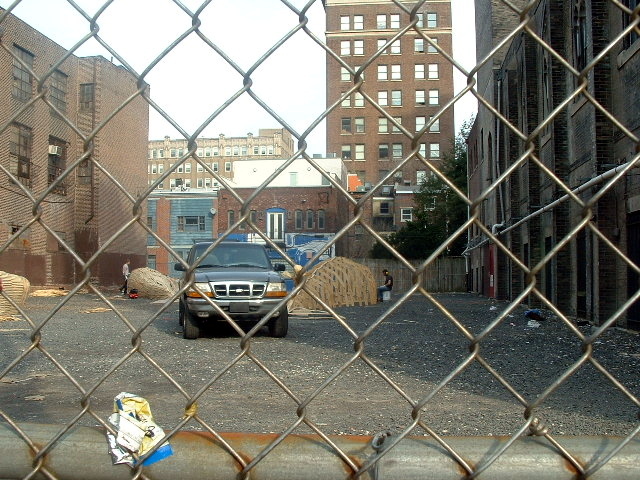 If little washers talk to me, bridges and pieces of buildings talk to her. Not only is her art beautiful and hard to forget; it will stoke your creative juices even more. Counting down the days before I leave for Baltimore Md for the National Polymer Clay Guild’s Synergy I Conference. In the meantime, here are two copper bracelets I am donating to the auction. One has polymer clay beads and the other is made with my lampworked beads. If all goes will, I will post a slide show of pictures when I get back. Stay tuned! There’s a lot of coffee in Brazil, or so the song goes. There are also a lot of poor people. According to some estimates, Brazil has the largest number of people living in poverty in Latin America. Artists don’t let the lack of traditional materials stop them from creating. And sometimes, the need to feed one’s family provides more motivation to make art than than waiting for one’s Muse. These forces converge on the beaches of Rio De Janiero where artists have found a way to make art and money from the sand and the ocean. 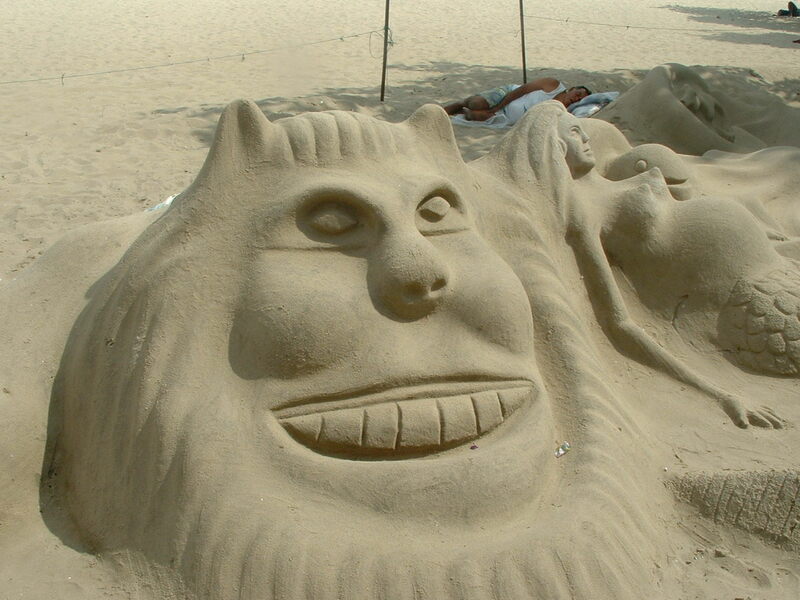 As you stroll along the beaches, you pass by realistic, intricate, larger-than-life sand sculptures. Looking is free, but if you want to take a picture, you stuff a few Reals in a can chained to a post in front of the sculpture. The artist spends the day with the sculpture, to maintain the fragile sand and water creation and to keep an eye on the can of money. In the pictures above, you can see the artist stretched out on a blanket behind the sculpture. He raised his hand in thanks when we stuffed some money into his can. We, in turn, thanked him making our walk on such a beautiful beach even more special.